This time of year I am all about simple dinners that don’t require a ton of effort or heating up the kitchen. One of my favorite things to make are simple grilled vegetables or grilled potato salads. I was making this particular grilled potato salad a lot last summer, but recently I decided to change it up a bit and use sweet potatoes. 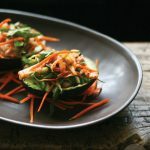 This salad is great as a meal on it’s own, or as a side to any grilled meat of your choice (local and grass-fed, of course). 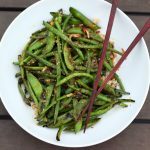 This salad has a wonderful tang from the vinegar, a little spice from the red pepper flakes plus a beautiful fresh and bright flavor from the kale. 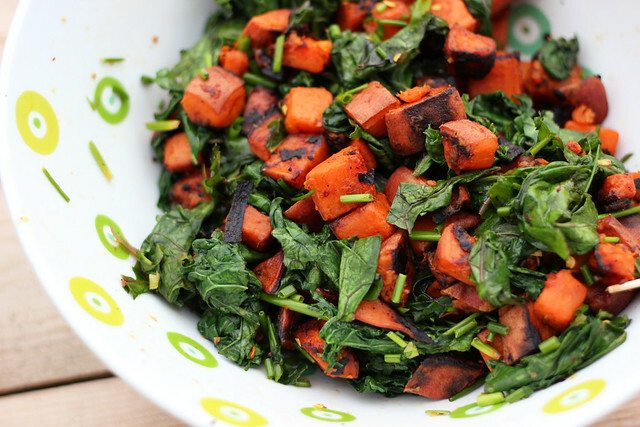 The kale’s subtle and satisfying almost spicy crunch is so nice paired with the tender and earthy flavor from the sweet potatoes. Besides being packed with flavor, this salad is loaded with nutrients and vitamins and other goodness. Sweet potatoes are an excellent source of vitamin A, in the form of beta carotene, and vitamin C. Sweet potatoes also provide vitamin B6, potassium, fiber, manganese, copper and iron. 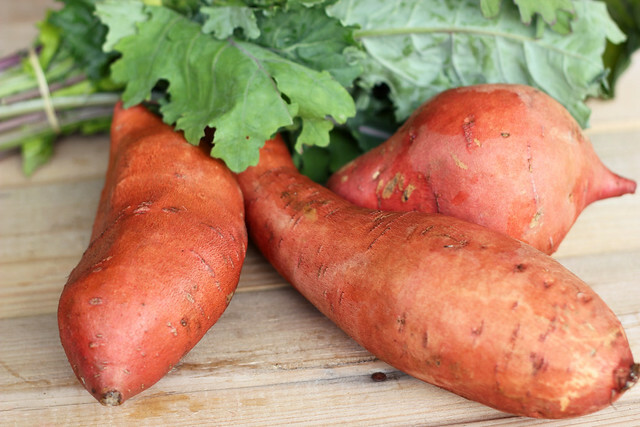 Sweet potatoes are naturally sweet-tasting but their natural sugars are slowly released into the bloodstream, helping to ensure a balanced and regular source of energy, without the blood sugar spikes linked to fatigue and weight gain. Leave the skin on for a nutty flavor and even more nutrients. And then there is the kale. Talk about a nutritional powerhouse. 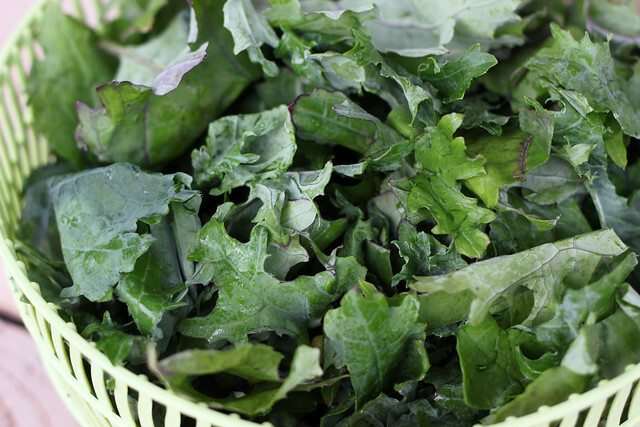 One cup of kale contains 36 calories, 5 grams of fiber, and 15% of the daily requirement of calcium and vitamin B6 (pyridoxine), 40% of magnesium, 180% of vitamin A, 200% of vitamin C, and 1,020% of vitamin K. It is also a good source of minerals copper, potassium, iron, manganese, and phosphorus. Kale, as with broccoli and other brassicas, contains sulforaphane (particularly when chopped or minced), a chemical with potent anti-cancer properties. Honestly, I could probably create an entire post for just the health benefits and nutritional values of kale. So instead, I will just say “EAT KALE”. Eat it often and enjoy it. It is so tasty! I still have another bunch of it from the farmers market and as much as I want to make this salad again, I think I need to try something new! What are some of your favorite things to grill? Preheat your grill. We have a charcoal grill, so we allow it to heat up for approximately 15 minutes. 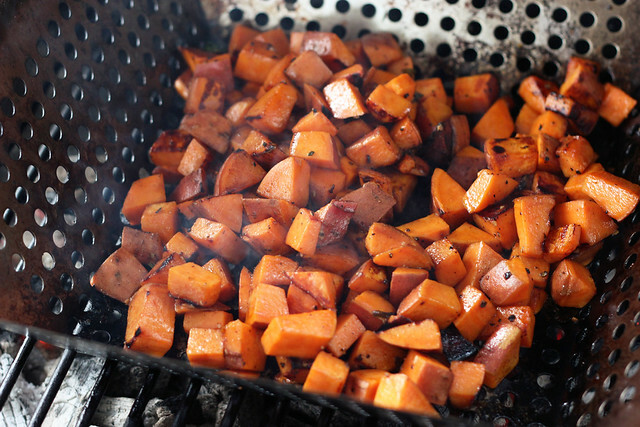 Place your grill basket or grill bowl onto the grill, and add the sweet potatoes. Tossing every 3-5 minutes allow the sweet potatoes to get tender and browned. But don’t toss them around too much, you don’t want to mash them up as they get more tender. Depending on the heat of your grill, it will take approximately 15-20 minutes. Be careful not to burn the potatoes, move the grill basket off of any large flames, if need be. oh those grilled sweet potatoes look amazing! what a salad! yum! thanks for sharing! I’ve never grilled sweet potatoes, but I bet it is amazing because I love roasting them. Try putting some rosemary on them-so good! 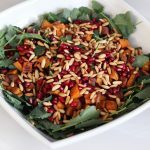 I love kale, too, and I’ve made a similar roasted sweet potato and kale salad in the winter with pomegranate. Oh so good! How would you prep this if you don’t have access to a grill? (college student) Thanks! I would recommend just roasting the sweet potatoes and tossing the kale in at the end for a few minutes, would still be just as tasty! Hope that helps. Just fixed this for supper and it was fabulous! I roasted the sweet potatoes in the oven at 450 on parchment paper and added the kale at the end as you described. Also, I can’t have the vinegar, but it was still delicious. I will definitely make it again. Thanks for the recipe and pics. made this for dinner last night with a few small tweaks. I used mixed greens – kale, swiss chard & spinach – and I sliced the potatoes & slapped them right on the grill. It was SO DELICIOUS!!!. The combination of the greens & the sweet potatoes is so unexpectedly good. Will definitely add this to my rotation. Thank you!!! 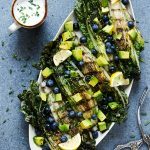 I never thought about grilling kale – will give this a try this weekend! Recipe looks great and will have to try this one. 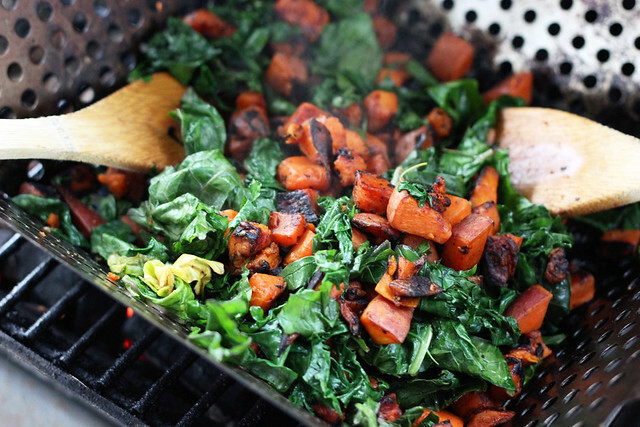 I’ve never grilled kale or sweet potatoes! This looks SO good! 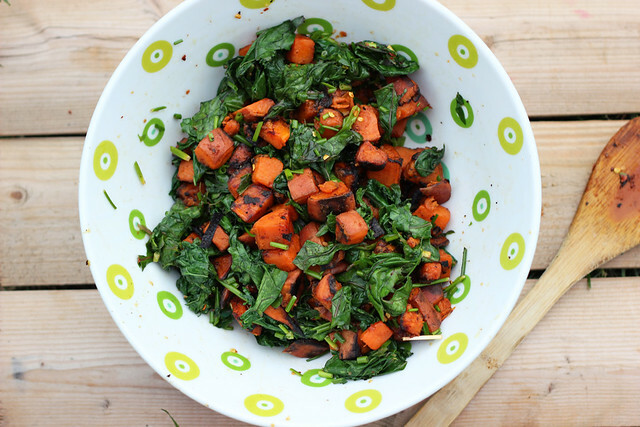 I love grilled sweet potatoes, but I haven’t thought to pair them with kale! I’ll have to try this!